Some new promo art has surfaced online for Avengers: Infinity War. 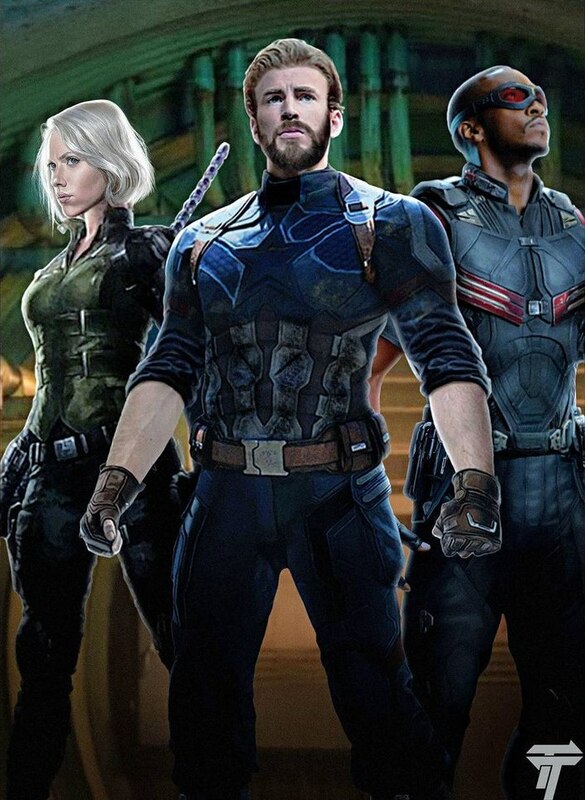 The art gives us an even better look at the costumes of Captain America (Chris Evans), Black Widow (Scarlett Johansson), and the Falcon (Anthony Mackie). I'm really digging the style of the new outfits! I especially like Black Widow's new look. We got a little glimpse of these new costumes in another piece of promo art that you can see here. But, this one, which comes from a fan page on Russian social media site VK.com, is a lot better. We also have a screenshot from the upcoming Infinity War trailer featuring these three characters that you can see here. It's a little difficult to see their costumes in that photo, though, because it's a bit dark and it's an overhead shot looking down on them. Infinity War is set to open on May 4, 2018.